I have been a competitive athlete for most of my life. Injuries–preventing them and dealing with them–are an important part of the athletic experience. This year I injured my knee, and the timing was terrible–a month before a big race, and two months before the race I’d been working toward for a year—the Ironman World Championships in Kona Hawaii. This race consists of a 2.4 mile ocean swim, a 112 mile bike, and a 26.2 mile run. I ran outside only 6 times in 6 weeks, but ran on Back to Motion’s Alter-G treadmill regularly. I ended up finishing second (in my age group) in the Ironman 70.3 World Championships in Mont Tremblant Canada in September. 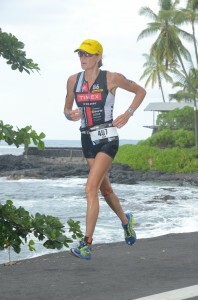 The next month I placed first in my age group at the Ironman World Championships in Kona. The Alter-G was crucial to my being able to maintain some fitness during my injury. The people at Back to Motion were helpful, supportive, knowledgeable and professional. I will continue to go to Back to Motion even after I’ve healed, so I can prevent further injuries. A huge thank-you to Back to Motion!! !